Comic Con Revolution took place on May 19 – May 20 at the Ontario Convention Center in Ontario, CA. Not to be confused with our Canadian neighbors, this Inland Empire convention brought in over 7,000 unique attendees over the two days. The family friendly event brought in cosplayers and many families bringing their kids to meet celebrities, authors, and prolific faces in nerd history. The Ontario Convention Center is fairly small; the convention utilized only the first floor, but it was sizable enough to hold the many families coming in and out. While there were a handful of local cosplayers, there was not much background for shooting. 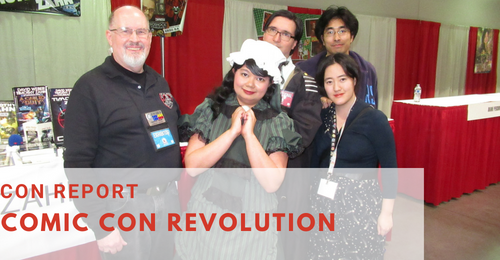 We were invited to run four panels at Comic Con Revolution.